I reached a little blog milestone this week, and I'm not afraid to scream about it. Selfridges asked me to take part in their advertising program (hence the banner above, have a little click). Their Oxford Street store is like a second home for me - well, in my dreams. I spend half my time and most of my salary in there - and could write their womenswear floor plan out for you in full. Some may call this sad, others will call this cool - I'm in the latter camp. For those of you who read this from abroad, Selfridges is a department store chain with an HQ in London on Oxford Street. It's the home of all things British, shiny and new in the fashion world - with additionally fab beauty and food departments. Their online store is worth signing up to as they receive a number of special editions and exclusives - have a peek here. In the run up to the Royal Jubilee (the big party we're throwing here in the UK to celebrate having a very ancient monarch) Selfridges have dedicated much of their store (and their site) to all things Britannia, British and quintessentially 'rah.' 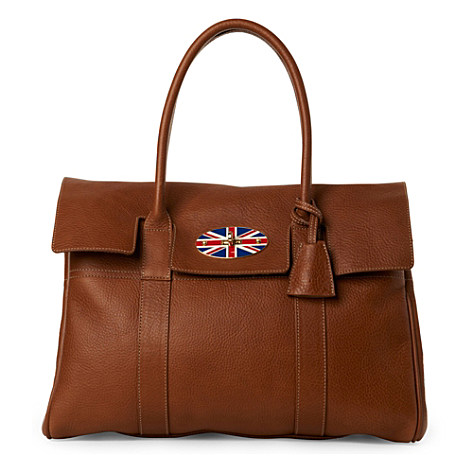 My favourite thing in the selection is this limited edition (and exclusive) Mulberry Bayswater handbag. Available for £795.00 online here or in store. DO IT. Ahh I was there on Saturday, looked like there had been a very classy and shinny Red White and Blue explosion! 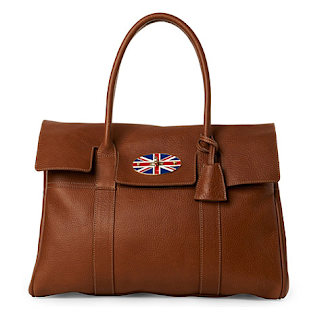 I'm not actually a fan of this badge, we think it cheapens the gorgeous bag a bit.